This DVF asymmetric scarf dress is simply amazing! I mentioned it on my Instagram story a couple of weeks ago when I wore it to a wedding with hubby. The vibrancy of the color mix coupled with the open back detail makes it a great summer wedding guest look. I love the asymmetric handkerchief hem and the way the smooth silk fabric drapes beautifully. The dress runs slightly big on the top half as such, I ordered a size down. 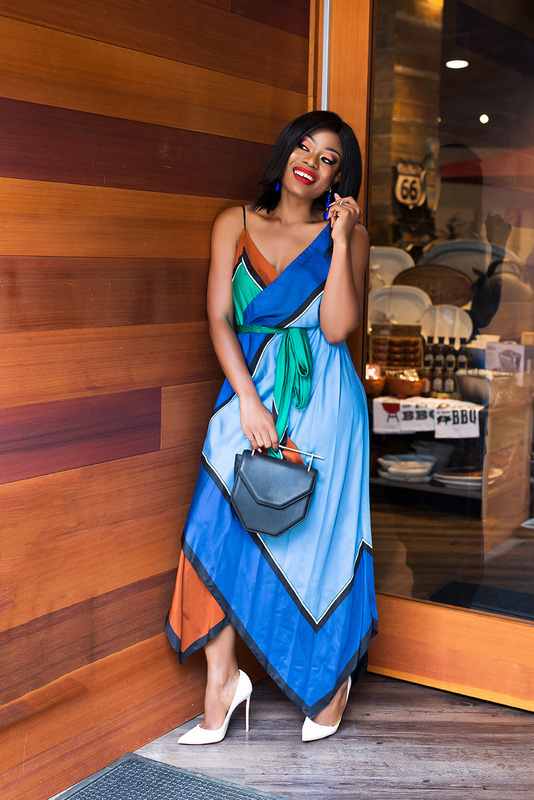 This printed silk scarf dress works well for all body types and for different occasions. I see myself wearing it on a vacation paired with flats. For today's look, I accessorized with white pumps and blue earrings to complement. Beautiful dress, especially those colors!